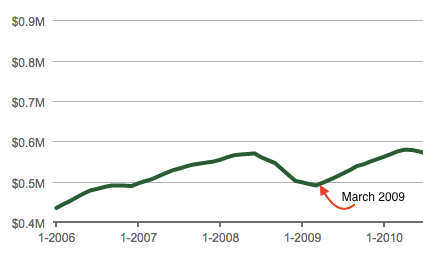 There is a direct correlation between the cost of real estate and mortgage rates. The more expensive it is to borrow money the cheaper real estate becomes and vice versa. History shows us this holds true. What many might not know is that variable mortgage rates are set by the commercial banks prime rates, which are essentially set by the Bank of Canada’s interest rate. 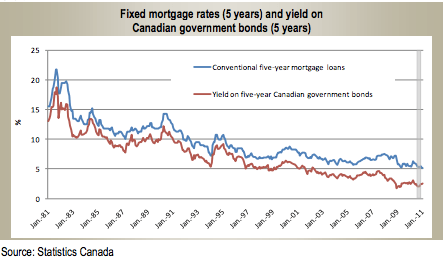 On the other hand, fixed term mortgage rates are primarily influenced by the yield on Canadian government bonds. In fact there is almost a direct correlation between the Canadian Government 5 year bond yields and the 5 year fixed mortgage rates. The 5 year Canadian Government bonds are also heavily influenced by their US counterparts. “Five years is sort of the middle ground, the pivot point where both U.S. and Canadian trends come into play,” explained CIBC World Markets Chief Economist Avery Shenfeld, referring to five-year Canadian government debt. Back in 2008 when the Canadian economy was teetering and Greater Vancouver real estate prices fell 14% the Bank of Canada swiftly hammered interest rates into the ground. The interest rate went from 4.5% in December 2007, to 1.75% in December 2008, to a ridiculous 0.50% in December 2009, which is where we still stand today. We sit at the lowest rates in Canadian history since they began recording in 1935. The Bank of Canada saved the real estate market in 2008, putting an end to a short 6 month correction and essentially avoided the financial crisis. By lowering the Bank of Canada’s interest rate the variable mortgage rate went from 4.55% in January 2009 to 2.5% by June 2009, instantly jump starting Real estate prices again. With the US federal reserve recently hiking their interest rates and 3 more hikes expected in 2017 the bond market is beginning to price for inflation, shooting bond yields through the roof. This has caused Canadian bond yields to surge in recent months, which are now at their highest levels since December 2014. Fixed term mortgage rates in Canada are climbing as a result. The 5 year fixed term mortgage rates have increased by 34 basis points over the past 2 months according to ratehub.ca. Prompting Bank of Canada Governor Stephen Poloz to flag this as a serious financial risk in his latest policy statement on December 7. This is placing added pressure on the Bank of Canada to follow our US neighbours and raise the overnight interest rate. However, it appears an unlikely scenario as the Canadian economy continues to struggle, coupled with record high levels of household debt. An interest rate hike could cripple highly leveraged households who will be unable to service their debt. Regardless, it appears the Canadian economy is stuck between a rock and a hard place. Should the economy continue to teeter or real estate falter interest rates have almost nowhere to go. The Bank of Canada appears to be out of ammo. If real estate prices fall, lowering interest rates won’t save the market this time around. This leaves the Bank of Canada and the Canadian Government in awfully tough predicament as they try to keep the real estate market afloat while also curbing household debt levels.